Human societies have long worked on changing nature's waterways for their purposes. Canals are artificial waterways constructed for irrigation , drainage, river overflows, water supplies, communications, and navigation, or in connection with power generation from hydroelectric dams. The digging of canals for irrigation probably dates to the beginnings of agriculture, with traces of canals found within ancient Chinese, Egyptian, and Babylonian civilizations. Written evidence shows that the Suez Canal, for instance, was excavated prior to 2000 B.C.E. It was documented to be navigable for small vessels by 600 B.C.E. and remained in operation for fourteen centuries as a convenient trade route between the Mediterranean and Red Seas. One of the world's longest canals, the Grand Canal of China, was constructed primarily during the seventh and thirteenth centuries. The 1,900-kilometer (1,200-mile) canal connected the cities of Beijing and Hangzhou, and is often considered the most notable of the early canals. The regions that built canals during the pre-industrial era were those possessing fairly level landscapes, like Mesopotamia (around Iraq and Iran), Egypt, and China, or where channels were branches of the sea, like in the Netherlands. This pattern occurred because the practice of building locks had not yet been invented. Nevertheless, these waterways were not constructed on one continuous level. Evidence shows that the early Egyptian and Chinese canals were adapted to the differing land contours, often using an inclined plane for transferring boats to successive levels. Even today, China uses similar methods on its extensive canal system. The introduction of locks throughout Europe—primarily for economic, political, and military gains—between the fifteenth and seventeenth centuries spurred rapid canal-building. France was the first to build extensive systems. The greatest work of that period was the Languedoc Canal, connecting the Bay of Biscay with the Mediterranean Sea. The canal, completed in 1681, was an enormous undertaking with its length of 240 kilometers (148 miles), rise of 183 meters (600 feet) above the sea, numerous locks and aqueducts , tunnel of more than 213 meters (700 feet), and capacity for floating gigantic barges. Historically, canals were constructed to "extend the sea," thereby connecting the sea with cities, and cities with the countryside. 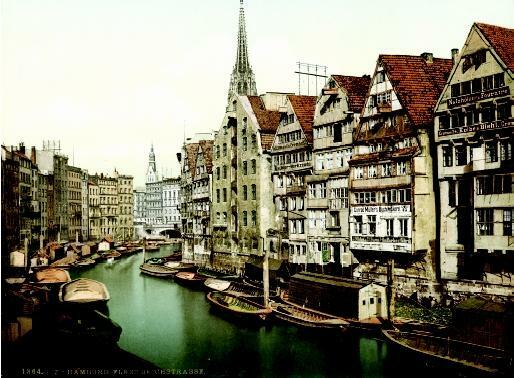 This scene of Hamburg, Germany in 1864 illustrates how canals influenced city life and culture. goods and materials during the Industrial Revolution of the eighteenth century. Canals served to open up countries to the Industrial Revolution, just as the Internet is opening up the world to the Information Revolution. Waterways afforded a cheap means of transportation, one that could bring input materials to production centers and then take finished products away for mass marketing. Thus, canals played a role in aiding the movement of populations to production centers. Canal building in Ireland, Scotland, and England flourished in the late eighteenth and early nineteenth centuries. Three of the most notable canals were the Grand Canal in Ireland, the Caledonian Canal in Scotland, and the Manchester Ship Canal in England. The Grand Canal was begun in 1756 for trade and passenger transportation, and extended 134 kilometers (83 miles) between Dublin and Shannon Harbor. The Caledonian Canal was completed in 1847 as a 97-kilometer (60-mile) waterway from Inverness to Fort William, to provide a safe route for naval ships during the Napoleonic wars. The Manchester Ship Canal, which was completed in 1894, opened Manchester Port to oceangoing vessels, and contributed to the thriving industrial English economy. 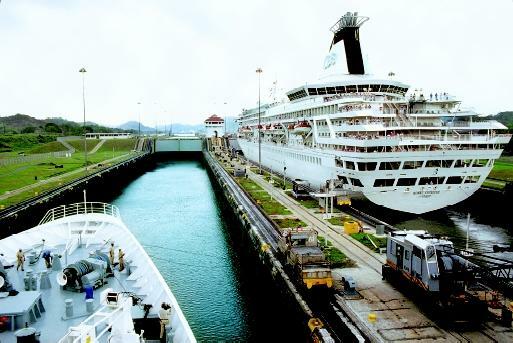 A large cruise ship and another oceangoing vessel pass through the Miraflores Locks of the Panama Canal. This large navigation canal, connecting the Pacific and Atlantic Oceans, is often referred to as the "eighth wonder of the world." to connect water bodies. For example, the German Kiel Canal was completed in 1895 as the shortest link between the North Sea and the Baltic. Today these countries possess an integrated waterway network such as the Midland Canal, a series of German canals that facilitates east–west transportation of raw materials and manufactured goods. In 1730, a small excavation was cut across a narrow piece of land in a bend of the Mohawk River near present-day Utica, New York. It is commonly believed that this canal was the first artificial waterway to be created in the United States, and today it symbolizes the beginning of the U.S. canal era. The first U.S. navigation canal was built in 1793 around the rapids of the Connecticut River at South Hadley, Massachusetts. Two levels that were connected by a water-filled incline transported boats by dragging them with cables operated by waterpower. The construction of the Erie Canal, started in 1817, was largely responsible for opening the American Midwest to settlement. More than 7,250 kilometers (4,500 miles) of water routes, mostly in the middle Atlantic and central states, were created from the seaboard to the inland lakes to help expand a fledging country. Large canals are primarily built for navigation. Navigation canals were developed after irrigation canals, and for a long time were level, shallow depressions, or had inclined planes in which vessels were hauled between levels. Over the years, such canals have been expanded in width and depth in order to accommodate larger boats, and they have, in some cases, been constructed to form bridges or to pass through tunnels to overcome mountains. Canals were built larger and larger so that water transport could better compete with railway transportation. Navigation canals usually are classified as either ship canals, which are deep enough to accommodate oceangoing ships, or barge canals, which are shallow and for use mainly by barges. On most large, shallow canals, barges are pushed or pulled by tugboats and towboats. Modern barges are designed to carry specific types of cargo: (1) open-hopper barges carry gravel, coal, and large equipment;(2) covered dry-cargo barges carry dry chemicals, grain, and other commodities that must be kept dry; and (3) tank barges carry liquid and petroleum chemicals. Some ship canals, such as the Suez and Panama Canals, provide navigational shortcuts by connecting large water bodies. The 64-kilometer (40-mile) long Panama Canal, which goes across the Isthmus of Panama in Central America, allows vessels to travel between the Pacific and Atlantic oceans, avoiding the long voyage around South America. At the time it was constructed, it was estimated that this trip around took approximately 5 to 6 months; the canal reduced the length of the trip to as many weeks. Other ship canals, such as the Houston Ship Channel (in Texas) and the Manchester Ship Canal (in northwestern England), connect an inland harbor to the ocean. These canals play an important role in the nation's waterborne transportation system. Major canals are usually constructed as open-cut excavations with the use of construction tools and machinery. The cuts are often built with masonry to prevent bank erosion. Unlike roads and railways, canals cannot be made to conform to terrain irregularities, but must consist of one or more level stretches. Where different levels meet, vessels are transferred from one stretch to the next by locks. When a boat enters a lock and all gates are secured, the downstream gates open and water flows in. When the level is equal on either side of the downstream gate, water stops flowing, the downstream gate then opens, and the boat continues onto the new water level. In the early years of canal building, when important rivers were found to be not navigable at certain points, side canals running parallel to the river were built so that vessels could bypass that section and reenter it at a more suitable point. With the invention of power machinery, this practice has generally been discarded in favor of canalization of the river itself; that is, a river is dredged at shallow regions and provided with dams and locks that control the river's level. In the United States, for example, construction of 40 locks and dams on the Ohio River was completed in 1929; and later modernized with 18 highlift locks in 1981. Canalization of the upper Mississippi River from Minneapolis, Minnesota to Alton, Illinois (just above St. Louis, Missouri), was completed in 1940. In 1954, the U.S. Congress authorized the federal government to join with Canada in the construction of the St. Lawrence Seaway. The United States built two canals, three locks, and various other improvements along the St. Lawrence River from Montreal, Quebec to Ogdensburg, New York. The Canadian canal system includes the St. Lawrence River canals, the Ottawa River canals, the Chambly Canal, the Rideau Canal, and the Trent Canal (part of the Trent–Severn Waterway). Of these, the St. Lawrence system has long been the most important, because it provides a waterway 4.3 meters (14 feet) deep from the head of Lake Superior to the Gulf of St. Lawrence. As part of the project, completed in 1959, the waterway was deepened to 8.2 meters (27 feet) to permit large oceangoing vessels to sail from the Atlantic Ocean to such ports as Chicago, Illinois, and Duluth, Minnesota. The 3,700-kilometer (2,340-mile) Great Lakes–St. Lawrence Seaway system is the world's longest deep-draft inland waterway, extending from the Atlantic Ocean to Duluth, Minnesota on Lake Superior. SEE ALSO Army Corps of Engineers, U.S. ; Leonardo Da Vinci ; Navigation at Sea, History of ; Transportation . Hadfield, Charles, ed. World Canals. Newton Abbot, U.K.: David & Charles, 1986. Shaw, Ronald E. Canals for a Nation. Lexington: University of Kentucky Press, 1990. Make the Dirt Fly! The Building of the Panama Canal. Smithsonian Institution Libraries Online Exhibit. <http://www.sil.si.edu/Exhibitions/Make-the-Dirt-Fly> . The Panama Canal, which crosses the central part of Panama in Central America, was built by the United States from 1904 to 1914. Under a 1903 treaty, the United States controlled as a U.S. territory both the waterway and a 16kilometer (10-mile) swath across the isthmus known as the Panama Canal Zone. During most of the twentieth century, the Panamanians resented this arrangement, arguing that their country was unjustly denied canal benefits. Eventually, riots and global pressures led the United States in 1979, under then-president Jimmy Carter, to recognize Panama's eventual ownership of the canal and all the surrounding lands. Former president Carter and Panamanian president Mireya Moscoso signed documents in December 14, 1999, giving Panama full control of the Panama Canal. The actual transfer to Panama occurred on December 31, along with complete control of canal operations and full possession of the Panama Canal Zone.